...we noticed something a little bit different. "what's that?" asked dav with a scrunched up nose, pointing to the vent. 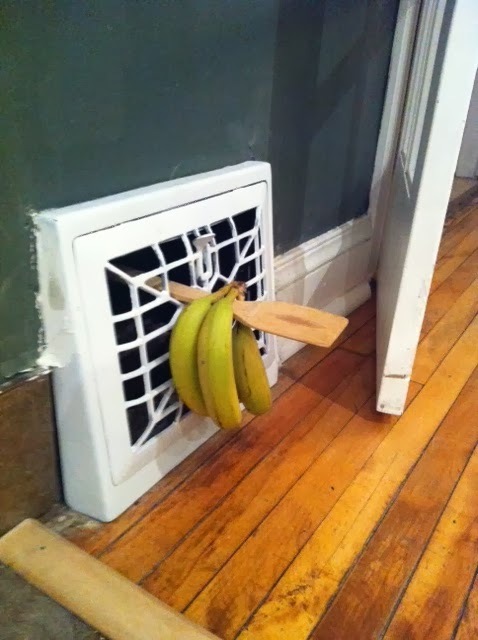 stuck in the vent was a wooden spoon with a bunch of bananas hanging off the end. "i don't know" i said puzzled. and we puzzed & puzzed until our puzzlers were tired. dav was sure it was an alien invasion. eva thought it was the mice that frequent our kitchen trying to get our attention. kai just cried. it was too weird for him. livi babbled on about some kinda crazy and i was genuinely freaked out. i just could not think of why anyone would come into our house & set that up. we had had the mckinnons over the night before. could it have been them, continuing in their pranking tradition? no, this was too weird. there had to be a perfectly reasonable explanation but i sure was getting worked up into a jitter thinking of the worst possible conclusions. and so, we just left it there. i made sure no one touched it & tried my very best to resist the burning temptation to bound up the stairs & shake steve awake, who was soundly slumbering, and shout "something's gone CRAZY in the kitchen!!!" it is upon reflection that i realize i might have the inherited the knack for 'catastrophizing'. catastrophizing: the habit of automatically assuming a "worst case scenario" and inappropriately characterizing minor or moderate problems or issues as catastrophic events. others have described it as shutting yourself in your own "emotional panic room". this does not only happen when i find kitchen spoons & bananas hanging out of vents but often when facing any kind of routine challenge. if one of our kids behaves poorly while out in public i automatically jump to the conclusion that they will become a menace to society if not stopped. if i make a poor parenting decision or lose my cool, i'm a terrible mother not worthy of her children. i know we all have our moments of jumping to conclusions now & then, but for me, this has been an unhealthy habit which needs to change. it turns out that steve had rigged the banana-spoon lever system to keep the vent open. we had recently replaced the vents with some antique ones we had bought at a garage sale & the flappy thing kept closing, which was messing with our heat in the kitchen. no aliens. no creepy stalker message. no attention starved mice. catastrophizing, indeed. Dear friend, guard Clear Thinking and Common Sense with your life; don’t for a minute lose sight of them. They’ll keep your soul alive and well, they’ll keep you fit and attractive. You’ll take afternoon naps without a worry, you’ll enjoy a good night’s sleep. or predictions that doomsday is just around the corner, because God will be right there with you; he’ll keep you safe and sound. I just caught up on all your blogging for the past month, Sarah. So nice. I can relate to the catastrophizing. And like you say, everyone does it but you know when it becomes a bigger problem than what most people face. Thanks for the great visual of propping open the vent and letting Christ into the picture in the midst of the catastrophic spiral. Love you.